The article was originally published at the Moscow Carnegie Center web-site. Uzbekistan will hold next presidential elections on March 29. The incumbent president, Islam Karimov, will be running for the fourth time in row even if one would not count the two times he remained in office, having extended his term at two referenda. Most probably Karimov will win again. That said, this time around the victory will not come so easily as before, because he now faces a truly formidable opponent—his own frail health, which has already managed to knock him out of the electoral campaign and public life for about a month. An era unfolding in Uzbekistan over the last quarter century will undoubtedly be known as the “Karimov era.” People will start saying “in Karimov times,” as we now say “in Stalin times” or “in Khrushchev times,” thereby implying a period in the country’s history and the political life at the time. Obviously, the very use of “Karimov” in discussions of history will entail the whole life at the time of this authoritarian ruler’s term in office. That the Karimov era was unfolding became absolutely clear in mid-1990s. Having become president on 24 March 1990 shortly before the collapse of the Soviet Union, Islam Karimov has not left the post even for a minute. While political changes and disturbances were taking place in Russia and other post-Soviet countries, Uzbekistan remained alarmingly silent: neither the presidential palace was seized, nor putsches were staged, nor modernization took place; not even the Putin-Medvedev style “We came to an agreement” kind of power shift and handover, however hypocritical it is. What did take place was the recognizable slow and unshakeable conservation of the “leadership and guidance,” just not of the communist party this time, but that of a singlehanded ruler. Thus, the current head of the Uzbek state is Brezhnev, Gorbachev, Yeltsin, Putin, Medvedev and Putin again in and of himself. The only match in terms of fate and status quo to Karimov in the region is Nursultan Nazarbayev, who heads Kazakhstan that shares with Uzbekistan not only geographical proximity, but also much in terms of politics. Indeed, President Nazarbayev is the second eldest head of state in post-Soviet territory. To be sure, the upcoming presidential elections in March and April, respectively, further buttress the similarities. As Sergey Duvanov, an Almaty-based journalist, aptly put it, the upcoming elections are nothing but a completely managed, foreseeable and ritualistic procedure, which will only serve as an excuse to legitimize yet another illegitimate term of the same person in the highest office. That said, there is one glaring difference: the Kazakh president’s health is discussed much less than that of the Uzbek president’s. The latter, 77, is even said to die soon even though he is only two-and-a-half-year senior to his Kazakh counterpart. Secret foes and openly oppositionist ones started circulating rumours about Karimov’s illness and even death for the first time about 10-15 years ago. Such rumours would pick up intensity especially ahead of elections and/or other important state-wide events. However, those rumours’ scale pales in front of the one circulating this time around. On January 28, the website of the Popular Movement of Uzbekistan, an opposition group abroad, cited its sources to claim Islam Karimov fell into a coma. The Uzbek president’s disappearance from public life for almost a month after the report only lent credence to the claim in it. Later in early March, the pre-election campaign has officially kicked off in Uzbekistan with the participation of all four registered candidates. The presidential hopefuls are going places to garner the electorate’s support for their candidacy; everyone but Karimov. The news on the Uzbek leader’s ill health was on the pages of hundreds of mass media. Foreign ones that is, because the local ones, for obvious reasons, kept silence. The reason is the atmosphere that Islam Karimov and his team forged in Uzbekistan over the last 25 years. The “atmosphere” in question not only houses no oxygen for independent mass media outlets, but also chokes one with the musty smog of officials’ lies. Conversations on politics can only be heard in taxicabs or bazars—the Central Asian analogues of social media. Therefore, the lack of even remotely reliable information paves way for speculations, wild guesses and most ludicrous presumptions. All that said, Uzbek citizens are perfectly aware they would learn about their leader’s death only a few days later; this has been their historical experience so far. For instance, the deaths of Leonid Brezhnev or Saparmurat “Turkmenbashi” Niyazov were publicized only many days after the fact. The reason is simple: people in the late leaders’ surrounding must first come to an agreement as to who does what now. Over the several weeks during which Islam Karimov was reportedly recuperating from illness, there was not a single report, however short, about him or his health on any of the numerous official mass media outlets. (One ought not to dismiss the possibility that he may have been simply taking a break from everyone and everything in his dacha.) The president’s press service was silent as was the main news agency, UzA. The president’s nominators, the UzLiDeP, were quiet as was the Central Electoral Committee. Even those central TV mouthpieces, who miss no opportunity to praise Karimov’s “wise and balanced leadership,” kept silence. Most curiously, the other presidential hopefuls—yes, the so-called “opponents” of Islam Karimov—were also quiet even though they never miss a chance to praise his policies and urge everyone to vote for the most beloved Karimov, not themselves. Moreover, local channels carried a pre-election campaign of a candidate whose last name causes chuckles among Uzbek speakers—Khatamjon Ketmonov. Think of a name like “Johnny the Shovel Master.” So some “shovel wielder” is shown on TV and is given time and air to discuss his plans after he becomes president, but the father of the nation and the irreplaceable leader was not even mentioned. This fact has caused strong suspicions and worries. After all, Mr. Ketmonov’s such a lengthy pre-electoral campaign could not have been aired unless an order to do so came from the higher echelons of power. But who could have possibly given such an order if Karimov himself was suffering from a serious illness? Someone from his immediate circle, like his wife? Or the person who has hastily installed this marionette candidate? Now, if the suddenly reported ill president himself gave the order, then why did he hide in the first place, allowing for the advancement of an absolutely inappropriate candidate for presidency? To check his surrounding’s loyalty? To establish more or less decent and presentable facade of elections in the international community’s eyes? There are no answers to these questions at this time, nor should one be expecting them anytime soon. Perhaps there is no room for conspiracy theories in this case: Karimov may have felt himself somewhat ill, but not as bad as his opponents would hope. Also, he may be enjoying the services of highly qualified physicians (German or Israeli ones), who are capable of putting an elderly man back on his feet in no time. After several weeks of being absent from public life, President Karimov resurfaced as if nothing happened: central TV channels provided an coverage of his pre-electoral campaign trip to Kashkadarya Region. 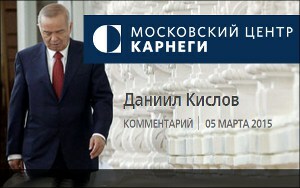 Candidate Karimov is daily seen on TV screens now. There are now billboards from which candidate Karimov again promises “Peace, Prosperity and Democratic Renaissance,” should voters support him again. So the fledgling intrigue decreased to naught: the president is back in public again with the same rhetoric, a relatively cheerful smile and quite a handshake, as “those with knowledge” claim. The upcoming presidential elections—whatever the number is; no one remembers anyway—will take place with no problems or hiccups. And he will win… despite the status quo and all those claims about the violation of the Constitution, the electoral legislation or even just ethics. Nor should one be looking forward to hearing any substantial criticism from abroad, except maybe from international human rights watchdogs or the humbly limited mission of the OSCE/ODIHR election observers. Even Washington stated its readiness—in the words of a top State Department official—to work with the Uzbek leader. In this perfect-for-Karimov picture one broad stroke is amiss—physical health. Indeed, Islam Karimov is not young and full of life any more. But he, apparently, is absolutely certain of his own immortality and definitely not ready to transfer power.